If you have been following Conversations with Bob you know I have Bipolar Disorder. It doesn’t usually get diagnosed as the first problem. I’d had problems with anxiety and depression since I was a teenager. But in Titusville, NJ things took a different spin. First Pres Titusville, (I have now been pastor at 3 1st Presbyterian Churches, all with no 2nd Presbyterian Church in town), is a great church. There was a bit more conflict there than I expected but all in all they are good people and a good congregation. Oh! I forgot to mention, while in Titusville I got into my ancestry and all things Scottish. 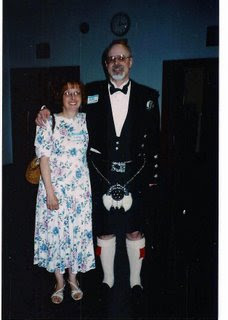 I’m a kilt wearing pastor, although I still wear pants most of the time. My children are embarrassed to be seen with me in a kilt. My wife just accepts that it’s me. Have I said I really love my wife? She doesn’t put up with me wearing the bonnet. The bonnet is too much for her. Anyway, that’s why there is a picture of me in full dress kilt at the top of the page. You Can’t see the plain because the picture is too dark but that’s Black Watch, the original Campbell plaid. Yet one more reason why I like and respect you. Thank you for your honesty and vulnerability for sharing your story. I am impressed that you were able to integrate your own personal struggles into ministry. Your congregation is truly blessed. Thanks Bob. It does seem that in our weaknesses, the Lord shines through. I look forward to reading about Philly. Thanks for your sharing. I suffer from mild SAD. Most of the time, I treat it by getting outdoors (I love the cold). Unfortunately, my current job has me in an office with no windows - so I needed a little pharmaceutical boost to get me through March. I'm hoping that by this winter, I'll have a church and the flexibility of getting outdoors! One note on healthcare: anybody can negotiate the price. The insurance companies are skilled and - because they can pay immediately - generally get better results. But anybody can negotiate their healthcare costs if they are willing to do so. That's one of the benefits of keeping our medical system only mildly infringed-upon by the government. I've personally taken a Korean student who had emergency foot surgery done and we were able to negotiate it based on what he could afford (i.e., not much). The cost came down to $2500 - which his sponsoring church and the Korean Congregation at my field placement took care of for him. I've said it before and I'll say it again: What the poor need are advocates, not necessarily advocacy.